With Fairy Cut's gallery of images as well as easy-to-use welding tools, it was quick work to make this special birthday card. 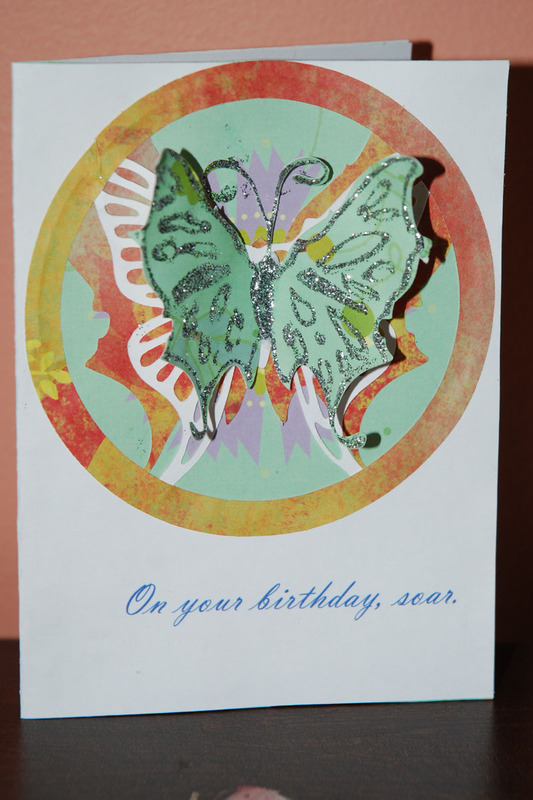 For its base, I used a butterfly that was cut out of a circle on the card front. On the program, the butterfly image is shown as a square; I wanted a rectangular shape, so I simply added and welded a smaller rectangle to the bottom of the square. Then I added and welded a card back to the original image to get a card. I cut two plain butterflies from another image found in Fairy Cut's "animals" gallery. One, the orange-ish base cut, was made larger than the top seafoam green butterfly. To alter the image, simply grab the corner border square and drag. Easy-peasy! I had my Cricut "Cakes Basics" cartridge already plugged in (you need one cartridge to operate the system, with any cutting program), so I cut the orange-ish circle outline using that. It's no problem jumping from one cutting program (Fairy Cut) to the cartridge cut, and back again. A little Stickling and assembling the pieces and I was all done. If you haven't explored the possibility of using your computer to generate your custom images, and a cutting program like Fairy Cut to drive the blade, you're really missing out on a wide world of wonderful images! 1. Be or become a follower here. ...then, you become eligible to win a monthly prize from www.FairyCut.com of a free Fairy Cut software license and access code (a $99 USD value), thanks to my friends at Fairy Cut. The winner will be selected at random by FairyCut, and notified by the manufacturer within one week after the end of each month. Please read the "fine print" below -- and don't forget to post your comment! I'm first to comment woo hoo! Who knows maybe #1 will be come lucky again, hehehe! Thank you so much for sharing this beautiful card, I love it, and this program sounds awesome! Thanks for a chance to win Ellen. I would love to have this system! The butterfly turned out really cute. You make it sound so easy!! Great job. Like all the stickles on the butterfly. Simply Beautiful!! Thanks for sharing!! I love the card. I tried to download a trial copy of Fairy cut but it would not work. Said I had O time to try it. Have contacted the company to see what happened. It seems to be a good program to use with the circuit. I am anonymous and can't sign on with a name. What do I do to correct this. I sure hope I win!!! Thanks for the post! I love your card. Thanks for sharing. I always get good ideas from you blog. Thanks.